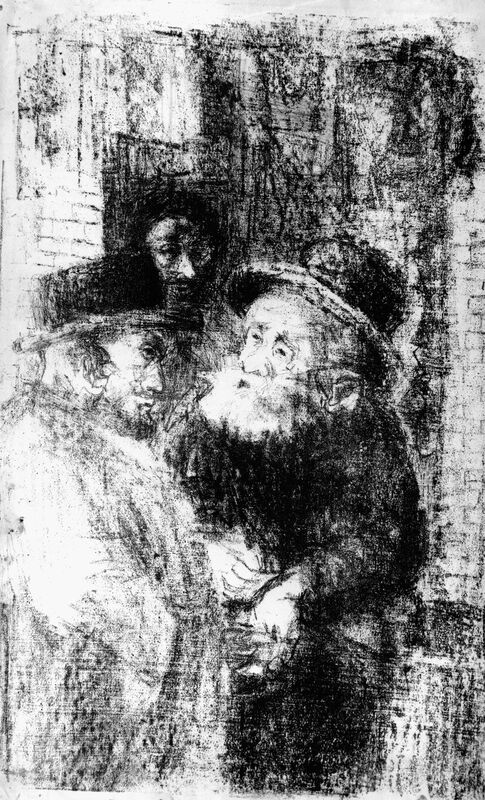 description A highly accomplished, three-quarter length, double portrait lithograph of two orthodox Jewish men engaged in a conversation in the street, with the head of a third figure just visible behind them. Frankfurther captures the warmth and intimate rhythms of the old Jewish East End life in a composition which reflects her abiding admiration for Rembrandt. Other lithographs, such as 'Cloth Merchant, Whitechapel Market', also represent aspects of traditional Jewish, East End life. exhibition history 'Eva Frankfurther 1930-1959: Memorial Exhibition', Boundary Gallery, London, 15 June-18 July 2001, (84), as 'Street Conversation, Whitechapel', £200; 'Refiguring the 50s: Joan Eardley, Sheila Fell, Eva Frankfurther, Josef Herman and L S Lowry', Ben Uri Gallery and Museum, 108A Boundary Road, London, NW8 ORH, 14 Nov 2014-22 Feb 2015, (34). literature ed., B. Planskoy, 'Eva Frankfurther 1930-1959: Paintings, lithographs and drawings' (London: Peter Halban, 2001), illus., p. 35; ed., S. MacDougall, 'Refiguring the 50s: Joan Eardley, Sheila Fell, Eva Frankfurther, Josef Herman and L S Lowry' (London: Ben Uri Gallery, 2014), p. 33, and illus., p. 93.